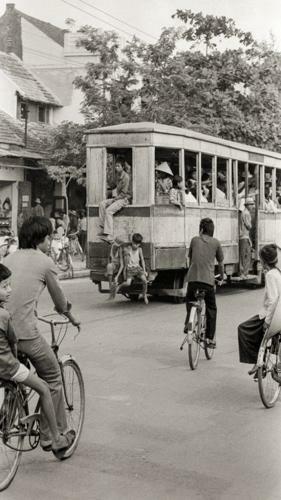 “Hanoi Mot Thoi” is a picture of daily life in and around Hanoi in the period after the war. 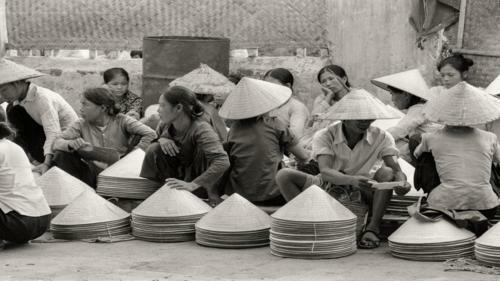 It sets black and white photographs taken by the former Deputy Ambassador of the United Kingdom to Vietnam, Mr. John Ramsden. This is a portrait of hardship, poverty and endurance but also of an ancient culture, of brave and resilients people of beauty amidst the austerity. John kept the photos as a reminder of a past life in a country that far away geographically from his homeland. 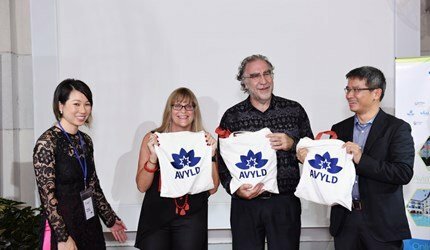 This memory was shared with everyone by the first exhibition held in Bath city, England in celebration of the 1000th anniversary of Thang Long – Hanoi in 2010. Kien first met John in 2013 while he was preparing for an exhibition in Hanoi. The photos took him straight back to his early years. Kien especially impressed with the picture of a young boy clining to the back of a moving trams. It reminded him of such an intense childhood. His family shared the poverty that was universal in those days and he had no money for a ticket. He queued and carried to help the parents as all children did back then. Kien then decided to become a main sponsor of the project “Hanoi After The War” – an international edition of “Hanoi Mot Thoi” which would be translated into English, redesigned and printed to the very highest international standards. The new edition helps get closer to the international readers who would love to know more about the history and culture of Hanoi in the 80s. The photographs are enriched with the memories of Vietnamese writers who knew the city from inside – who swept laves for fuel, queued before dawn to buy food, dreamed of owning a bicycle…The publishers are SKIRA who are famous for art and photography books. “I was glad to support John’s exhibition in 2013. It brought young people face to face, often for the first time, with images of the life their parents and grandparents had endured in those post-war years. For those who lived through the period, it brought back powerful memories, both of hardships overcome and of the strong spirit which helped us at a very difficult time. The book reminds us how much has changed in such a short time. But it also captures things that have not changed: the spirit of our people, the beauty of our country and the enduring strength of our culture”, Kien said in the foreword. “Hanoi After The War” will be officially released on September 27, 2018. Please visit AMAZON to pre-order and get the special offers and product promotions.